Current turnaround time is in the 1-3 business day range (excluding weekends). Now including free US shipping on all in-stock slings! Many babies like to see the world when they're out and about. This hold is particularly good for those who have good head control and are learning to sit supported, but who are not yet ready for the hip carry. Pay attention to your baby's cues. Smaller babies can become overstimulated by looking out at the world. They will generally signal that by turning their heads, flailing their arms, squirming, and generally appearing uncomfortable. If you notice this behavior, turn her back to facing you and offer some comfort. This position is best in short intervals with small babies. For older babies, I found that the facing-out position was harder on my back, as it shifts the baby's center of gravity, and tended to use it for only about 15-20 minutes at a time because of that. Start with the sling in corsage position, with the bottom edge brought up slightly to make a pouch on the inside, and hold your baby on your chest, facing outwards. With one hand, lift the baby so that her back is still against your chest, so that she doesn't fall forwards. This slinging position is most stable when the baby's legs are crossed, so cross her legs. 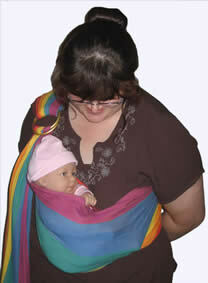 Pull her feet upwards, and with your other hand, open the sling to make a pouch. 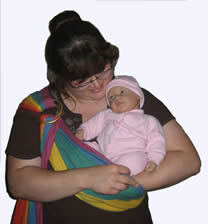 Lower your baby's feet into the sling, making sure that they are inside the fabric, and not going through the bottom. Adjust and tighten the sling as needed when the baby is in the desired position. The top edge should be particularly snug! Be sure to check the baby's position frequently, especially if you are moving around a lot. It is a good idea to keep one hand on the baby when using this hold, as smaller babies may suddenly flex their legs and "jump" out of the sling! 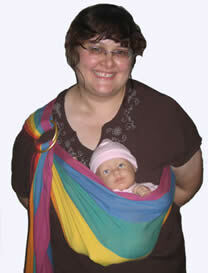 This is less of an issue with a stretchy sling, but can be dangerous if your sling is not made of a stretchy material. Be aware of your baby's position at all times! Also, this hold is not secure when you are bending over forwards. Be sure to hold onto your baby with your hands if you are bending over. An easy variation on this is a side-sitting carry – basically a cross between the kangaroo carry and the cradle hold. The baby goes in the sling with her head towards the rings, but sitting up. Her feet are inside the sling, as with the cradle hold, but she's upright and able to look around with her head free of the sling. Of course, this is appropriate only for babies with head control, but it's a great transition between the cradle hold and the hip carry.